Envision yourself piloting across the placid waters of Shagawa Lake. Enjoy the sun as you catch a fleeting glimpse of distant wildlife. Teach the kids to fish from the deck, enjoy a picnic, or simply relax and soak in the scenery. The choice is yours. Our pontoon boats feature electric start, captain's chair and steering wheel, canopy, couches and 20-50 h.p. motors. Our on-staff certified mechanics ensure a safe and pleasurable experience for your entire family. All guests receive boating orientation and personal floatation vests. And don't forget! With your cabin rental, a complimentary pontoon boat rental is included. An unforgettable experience... 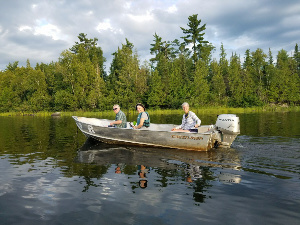 Located just minutes from Ely, Minnesota, Lady Bug Resort offers a variety of fishing boat and pontoon rentals to suit your every need. We offer four hour, full day and longer rentals to fit into your vacation schedule. Whatever your preference – a pontoon outing, or a fishing boat – Lady Bug Resort delivers. Weekly pontoon boat rental starting at $750. All boats available on Shagawa Lake or we will deliver to other lakes (fees apply). See our rate charts below.